Have you heard this line from a Robert Burns poem - "the best laid schemes of mice and men often go awry"? It reminds me that whilst I may carefully conceive in my thoughts a set plan or course of action, life will often step in and upend my scheme without explanation or apology. Too often in the past these detours brought anxiety and self-indulgent days, weeks and even months of regret and disappointment. My loss of control created feelings that can only be described as woeful, as in "Woe is me, my plans were thwarted and I could not do what I wanted!" Tears, angry words, and copious blocks of chocolate soon followed. I've seen toddlers like this at the supermarket checkout but let's not go down that route, okay? I'm truly not sure when the change in my 'control-freak' nature came about - a change that brought peace of heart, gentle acceptance and no need for explanations when life's path followed an unplanned course - but it did. Over time the unexpected hiccups that frequent my existence became less and less important. I began to rest in the knowledge that God had it all under control and if my own plans were the best plans He'd bring them to pass, but if He had an alternate journey or outcome that mattered more in the larger tapestry of life, then that's the way we'd go. You know, when you let go of yourself and all your personal quirks and desires and take to heart His promise in Jeremiah 29:11 ("For I know the plans I have for you," declares the Lord...) you'll find a peace and rest in your spirit that cannot be explained in human terms. It's quite truly super-natural. His peace knows no bounds and is not a one-size-fits-all measure, and it's definitely not peace according to the latest self-help best seller written for the masses. His peace is the exact peace that YOU, His precious child, will need in your very unique life circumstance today, tomorrow, or next year. His measure is given to you, as much or as little as you need, freely available 24/7 and offered with a Love you will not fully grasp until heaven. Let go of your need to control. Look up, breathe, your Prince of Peace is with you always. We all need to be reminded of this often. Especially myself. I often remind myself that I am not driving the train, don't have that responsibility. So glad you have achieved peace through your faith. Sending you much love my dear friend. Thanks for the reminder and exhortation. May God continue to bless you as you bless others. Thank you for sharing your thoughts and always taking time for your readers. A very timely post, Jenny. I needed this today. Thank you. I can truly say that since my mom passed away in July, I have a totally new outlook and peace about a lot of things, in my life. I always look forward to your Sunday post. You certainly have a gift for interpreting scripture and always feel like it's a mini-sermon, so to speak. It is uplifting and always something I need to hear. I may not post often about it, but I always read it each week. Blessings to you. Thank you for a very timely post. When I discovered last month that I have breast cancer, I realized that I would have no choice but to give up that control that I am so attached to. It has been hard to give it up, but I know Whow is in charge and I'm trusting in Him to take care of it all. This has allowed me to accept that I'm not going to be able to post as often to my blog as I did before, and realize that that's fine. It has allowed me to let minor things go without getting frustrated...or at least attempting it. (It's getting easier as I realize how those things do not really affect me. Thanks for the post, the reminder and another piece of scripture to keep close to my heart in the tumultuous time ahead of me. Good Morning Jenny! I believe that I have a rather flip side of the coin on this subject. Yet, tend to just accept it peacefully and move forward smoothly without looking back; just as you have described over time without really knowing when. I do know when I am fighting to stay on the path that I want...boy that fight is a doozy. So when I stop and ask the Lord for help and discover it is time to change it all falls into place so peacefully and magnificently. I laugh at myself and should have known right away! Thank you for sharing this fantastic message! Have a beautiful creative day! Very nicely said!! We all need to be reminded of this on a regular basis and I needed it today, thank you!!! I think it's harder when we're young to let go. It takes some time for us to realize that we are not in control and that life runs more smoothly when we say, "Thy will be done," than when we insist, "My will be done." This is one of my favorite scriptures, and I'm glad you shared it today. Amen. Peace that passes understanding. It is truly amazing when you let go and let God. I am a control freak who has learned to let "Jesus take the wheel" most of the time (work in progress, but making progress) and giving all my worries to Him, minute by minute sometimes :) His peace is to be desired and sought after...definitely "ahhhhhhh", the perfect place to rest! Such a beautiful verse Jenny. 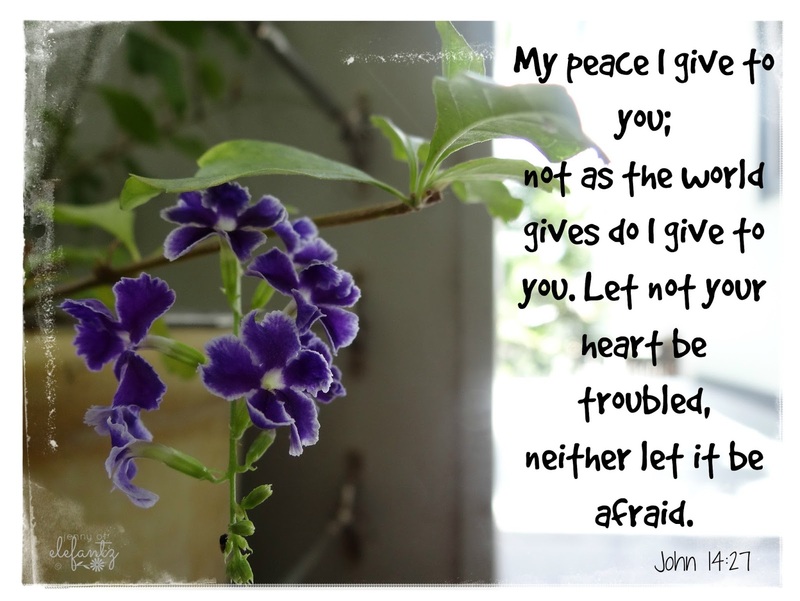 We are so blessed to have a God of peace to trust in and that peace is so precious when we leave all in His hands. My Nephew has just been diagnosed with Lymphoma, he is 14, How he and his parents and sister need that peace as he begins his chemotherapy.